As if parents and students don’t have enough to worry about! This article appeared in the NY Times today. Click here to read it at the NY Times website. And you thought it was hard to get into Yale. Try a competitive New York City public high school. Each year, about 80,000 eighth graders participate in the stressful and elaborate dance that is the New York City high school application process. Students can apply to up to a dozen schools anywhere in the city, and then an algorithm matches them with one. This week, students received their results. 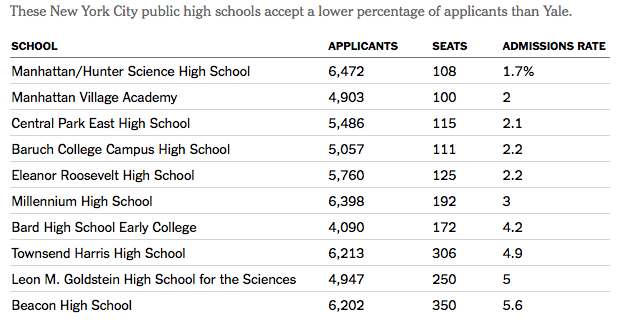 Using the number of seats available for the 2016-17 school year and the number of applicants for the 2017-18 school year, The New York Times calculated the admissions rate for some of the most popular high schools in the city (Year over year, the number of seats on offer tend to be quite similar. Schools that admit students based on where they live were excluded). The school with the lowest admissions rate was Manhattan/Hunter Science High School, which admitted just 1.7 percent of all applicants. Last year, Stanford admitted 4.8 percent of undergraduate applicants. Note: Number of seats is based on the 2016-17 school year. Number of applicants is based on the 2017-18 school year. All ten of the schools, among the most sought after in the city, are more competitive to get into than Yale College, which admitted 6.3 percent of applicants last year for the class of 2020. Some of them are even more exclusive than these raw percentages suggest. Baruch College Campus High School gives priority to students who live or go to school in Manhattan’s District 2. Last year 99 percent of its offers went to those students. Some of the city’s best-known schools, like Stuyvesant High School, are not on this list because students apply to what are known as the specialized schools through a separate process, in which admission is based on a single standardized test.